For me, this story encompasses not just Bob’s birthday in 2007, but also other events separated by many years, so this may jump around a bit. To understand the full impact on me you’ll need to know about these somewhat disparate points in my life. An elementary school music teacher let my class listen to the Album “Swithced-on Bach”. As most (or all) of you know, this album was performed by Walter (later Wendy) Carlos on synthesizers designed by Bob Moog. This starts my near life-long interest in electronic music. I loved the poem, looked it up and memorized it. I still remember it. I graduate from highschool and work various factory jobs, primarily to enable me to buy synthesizers. My interest in electronic music (and five years in a zinc die-casting factory) prompts me to return to school to get an associates degree in Electrical Engineering, after which I go to work as a printed circuit board designer. I spend the next ten years designing PCBs for the industrial computer industry. During that time, I learn that Bob Moog lives in Asheville and is giving a public lecture at UNCA. I attend the lecture and afterwards introduce myself. Bob calls me the next day and I wind up designing a few boards for him. This was back in the Big Briar days. These boards were for the Multi Touch Sensitive Keyboard that he designed for John Eaton, a product that according to the Moog Foundation, he considered to be his crowning achievement. This is of course a very significant event for me since he played a large part in me choosing electronics as a profession. After ten years as a printed circuit designer, I make a switch and spend the next ten years working primarily as a marketing manager, broken up by a year and a half stint as an engineering manager (high frequency CATV analog electronics). In addition to electronic music, I start playing music (on oud, flute etc) for belly dancers every weekend in Asheville, NC. Mid-afternoon, Sunday, August 21, 2005 – Preparing for a bellydance music gig, I get the idea to start a song by reciting “Abu Ben Adhem” over a low drum beat with Ishani, the dancer that night, playing the part of the angel. I call her to see if she has a “book of gold” to use as a prop. She does. Sunday night approximately 10:00pm, August 21, 2005 – We perform Abu Ben Adhem at Hookah Joe’s hookah lounge. Ishani is a great dancer and it is very well received. Monday morning, August 22, 2005 – I get an email from Barry Darnell who also did printed circuit design for Bob. The email informs me of Bob’s death. I had been out of touch with Bob for a while at that point. I heard he was sick, but had no idea that it was terminal. Needless to say, it came as a shock. Awoke one night from a deep dream…. When I heard that, I almost passed out. I was standing at the edge of the room. My legs got weak and my vision grew dark. And then I remembered that the email mentioned that Bob died at 2:00 on Sunday… right about the time that I got the idea to add the poem to our performance. I was in a daze for quite a while after that. I cannot say I knew Bob well. After doing the projects for him, I would see him occasionally here and there, but we never really hung out or talked about anything much other than electronics. The subject of poetry never came up. I’m still trying to understand the significance (if any) of this. The mathematician in me says that everything we do, think or say is an opportunity for a coincidence. That would add up to billions, trillions or more opportunities in a lifetime. If some amazing ones didn’t come along every once in a while, that would be the strange thing. But still, when something like this happens to you, it’s hard to be objective about it. In May of 2007, Moog Music hired me as Marketing Manager. This actually had little or nothing to do with the previous work I had done for Bob. Bob was gone and the only one there from the Big Briar days that even remembered me was Steve Dunnington. It was at this party that I first met Michelle Moog-Koussa. When I told her the story about the poem, her response was “Oh my god, you’re the “Abou-Ben-Adhem-Guy”. After Bob’s funeral, I sent my story to the Caring Bridge website set up for Bob and his family. Mixed in with the hundreds (if not thousands) of other comments, I didn’t think that anyone had seen it. I was wrong. Michelle: “It was the season finale (of season two). They were breaking into a bunker to stop the device that was jamming their radio transmissions. In doing so, they mortally wounded the person inside. As this person was dying they divulged, “The programmer was a musician. The password is GOOD VIBRATIONS”. It wasn’t over then either. At NAMM shows or during factory visits I heard many similar stories. It helped give my time at Moog a very surrealistic edge. Every year about this time Michelle and I talk about how all this needs to be written down. This was the year it happened. Trying to think of a good photo for this. I remembered this image. It has a bit of historical connection to the story. I created this in the early 90s. 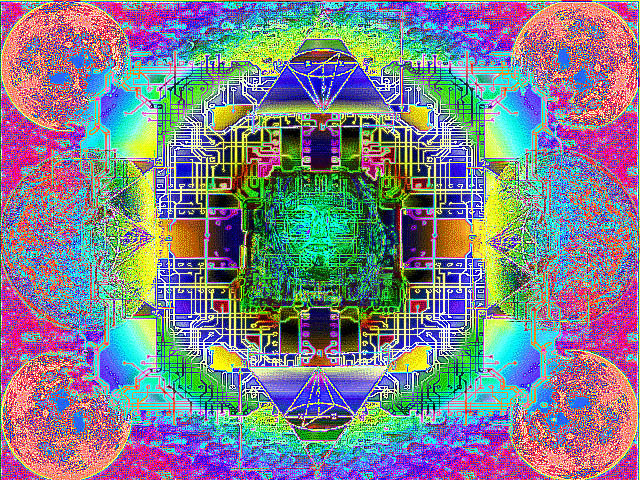 It was one of my first forays into computer graphics and photography. I think I did this in Aldus Photostyler on an 80386-based PC. It kind of has a vaguely cosmic/spiritual feel that fits the story. The circuit elements came from my PCB design work for Bob. He got a kick out of seeing it used this way. This image was used in the poster and ticket design for the first (and possibly only) rave in Spartanburg SC. 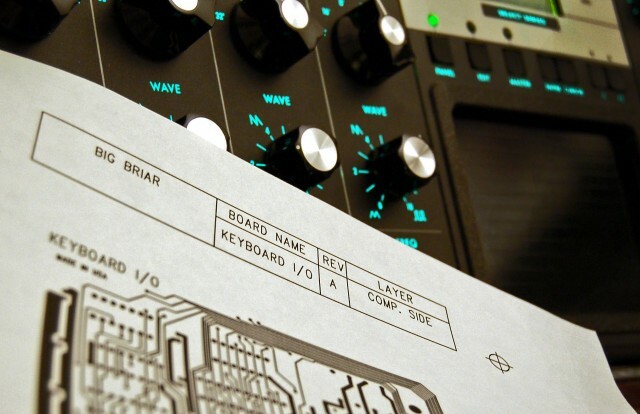 Here’s to all the ghosts in our machines, from Bob Moog to Max Mathews. I certainly feel their gifts in the work I’ve done just in the last couple of weeks alone.